With E3 2013 kicking off in LA this week, the lineups were quick to form for the more popular and wide-appealing titles. 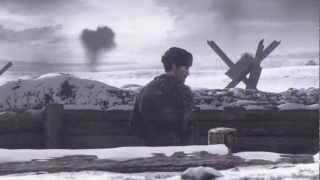 However, not every triple-A title is a shooter - as is proven by the popular PC RTS franchise Company of Heroes. The sequel, COH2, had a booth and playable area at the show which we checked out for some campaign impressions. We had a chance to sit down and play through a campaign mission from Company of Heroes 2's Soviet campaign. As is expected from a campaign design within an RTS, we started off with a couple of squads and with an objective to storm the beach of a frozen river against enemy defences. The goal was to take back the town from the Germans and turn the tide of battle. At our disposal were shock troops and conscripts, each with a special ability to help against enemy infantry - grenades and Molotov cocktails. 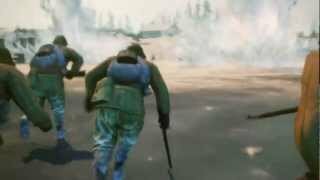 If you've had a chance to play the current open Company of Heroes 2 beta, the gameplay here is quite familiar. If you haven't - Company of Heroes is all about individual squad management and ability use while keeping to cover. Having rushed our troops onto shore, we cleared the enemy embankments who were fairly few in number and quick to retreat, even though the medium difficulty was set for the mission. With the area clear, we captured a strategic point and our AI built up a few structures - barracks and special weapons. This allowed us to recover some lost troops and bring in a few fresh squads. Additionally, some small tanks arrived off-map. The push now was to center of town. Sending the vehicles ahead to scout proved to be a poor idea, as foes now wielded AT rocket units who proved to be damaging. With a bit more micromanagement however, we were able to clear the area and capture the second strategic point. At this point, the game announced that the enemy is about to push back and to take up defensive positions. Using engineers, we repaired our vehicles and captured an AT Gun to prepare, while conscripts erected sand bags for valuable cover. In a few moments, the enemy began their push. But as new foes entered the area off-map, our troops held firm and vehicles provided some much needed firepower. Soon enemy tanks followed, and while they caused much havoc and took out a number of our forces, it was nothing that the AT crew couldn't handle. After the point defense was over, the mission ended. 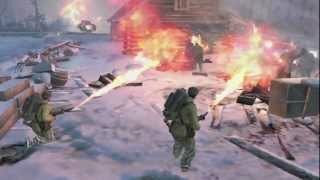 This taste of campaign action in Company of Heroes 2 showed that the already great gameplay design from multiplayer will be just as prominent in the campaign. The mission was cut short, wasn't very difficult and didn't showcase any creative design mechanics for an RTS campaign - but it's still one of the great RTS experiences on PC today. You can play in the open multiplayer beta this week, and look forward to the Company of Heroes 2's full game launch later this month on June 25th.